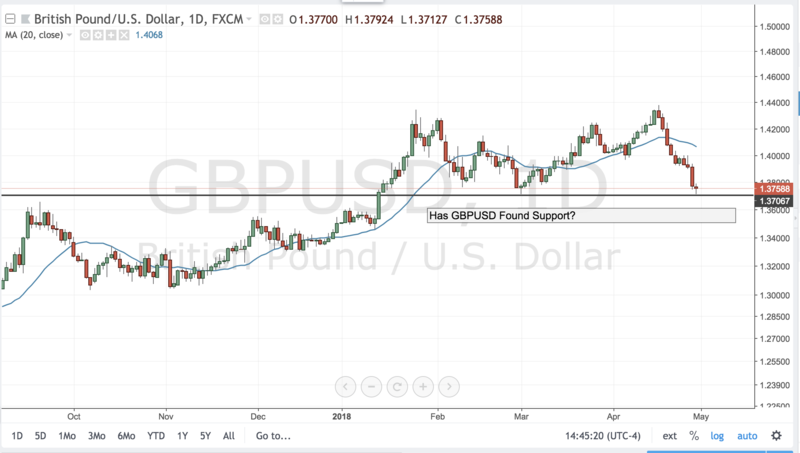 GBPUSD – Will 1.3400 Hold? Today almost all the BoE members were cautious in their Parliamentary testimony. They all suggested that monetary policy will move towards normalization sooner rather than later. This indicates that the much expected BoE rate hikes will simply be postponed to end of summer rather than 2019. UK data is the most important economic report in G-7 calendar this week and tomorrow’s UK CPI data, as well as Thursday’s Retail Sales, will go a long way to determining if cable can move through 1.3500 and stage a sustained rally. In the meantime, the pair continues to hold around the 1.3400 having failed in its breakout of 1.3500. If the numbers miss their mark, the pair could be on its way towards 1.3300 by week’s end. The currency markets are eyeing geopolitical risks this morning as President Trump says an attack on Syria could happen very soon, or “not at all.” While this creates more confusion than clarity, investors are relieved that an announcement wasn’t made overnight. By hitting Syria, the President is taunting Russia and the greatest implication aside from military engagement, U.S. dollar weakness and risk aversion is higher oil prices. USD/CAD remains under pressure was investors eye the headlines for updates on Trump’s decision. Softer Eurozone industrial production makes the euro the weakest performing currency this morning. Sterling came back strongly after dropping below 1.4150. USD/JPY has moved to the top of its recent range on the back of higher bond yields and Dow futures, which are pointing to a positive open. AUD is flat while NZD continues to outperform. There are no major U.S. economic reports scheduled for release today so keep on the headlines and stocks. GBP/USD will be on the move with U.K. composite and service sector PMI numbers schedule for release on Thursday. So far we know that manufacturing activity remained stable but construction activity contracted in the month of March. 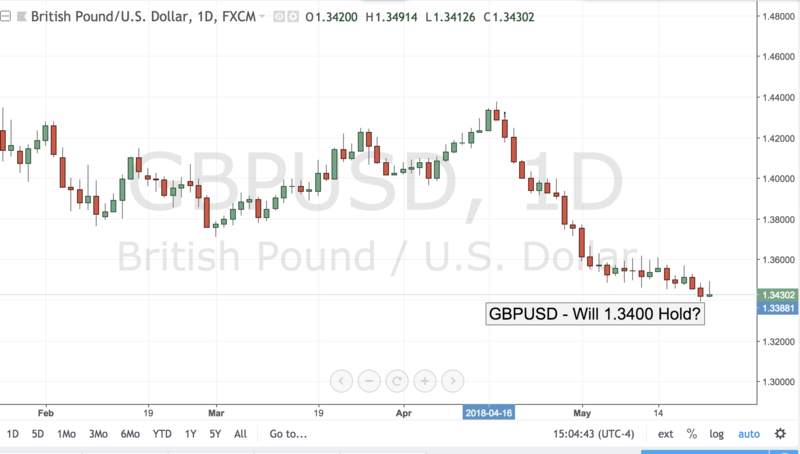 Higher highs and higher lows over the past 4 trading days suggests that GBP/USD wants to rally but strong data will be needed to drive the currency pair upwards. The Bank of England is widely expected to be the next major central bank to raise interest rates but investors are looking for data to validate their hawkishness before buying the currency. Technically, GBP/USD has strong support at 1.40. Not only is this a significant round number, but its also where the 20 and 50-day SMAs converge. If GBP/USD breaks above 1.41 on the back of stronger data, the next stop could be 1.42. After yesterday’s sharp sell-off in stocks, we are seeing risk appetite return this morning with the U.S. dollar trading higher against most of the major currencies. USD/JPY is at 106.50 and EUR/USD is holding above 1.2300 but support looks tenuous as the dollar could add to its gains ahead of tomorrow’s FOMC rate decision. Sterling took a hit from weaker CPI and could succumb to stronger selling than the euro. The commodity currencies are holding on strong with USD/CAD eyeing a move to 1.3050 and beyond. The Australian dollar is one of the strongest performers for no reason other than the fact that it experienced heavy selling over the past few days, so a healthier reversal is likely. The New Zealand dollar is lagging behind as investors worry about this morning’s dairy auction and tomorrow afternoon’s RBNZ rate decision. It should also be a busy week for sterling with a Bank of England monetary policy announcement, retail sales, consumer prices and labor market reports scheduled for release. After numerous tests, GBP/USD rejected 1.40 and appears on its way back down to 1.3800. Whether this key level is broken or not will be determined by the BoE and FOMC rate decisions. American policymakers meet before the Brits and they are widely expected to raise interest rates for the first time this year. Yet what’s important is not the rate hike but their guidance on future tightening. If the dot plot shows policymakers leaning towards 3 instead of 4 hikes, the dollar should fall, driving GBP/USD higher. If it shows 4 instead of 3, GBP/USD could fall aggressively. 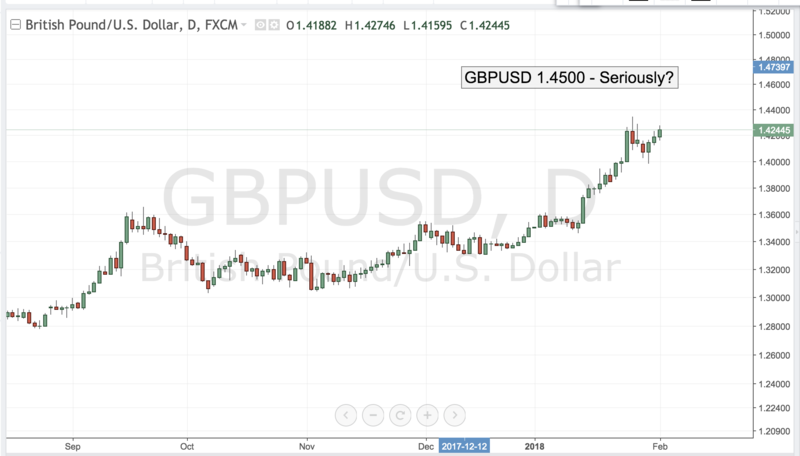 As for the BoE, at the last meeting sterling shot higher after the central bank raised their 2018 and 2019 GDP forecasts adding rates may need to rise faster and earlier than previously expected. This hawkishness caught the market by complete surprise. Although here’s been more weakness than strength in the U.K. economy since the last meeting (manufacturing activity slowed, retail sales growth barely turned positive) and consumer price pressures eased, its unlikely that the central bank will walk back their positive outlook so quickly. This is not a monetary policy announcement that is accompanied by a press conference by Mark Carney (like the last one) so the statement is likely to be unchanged. 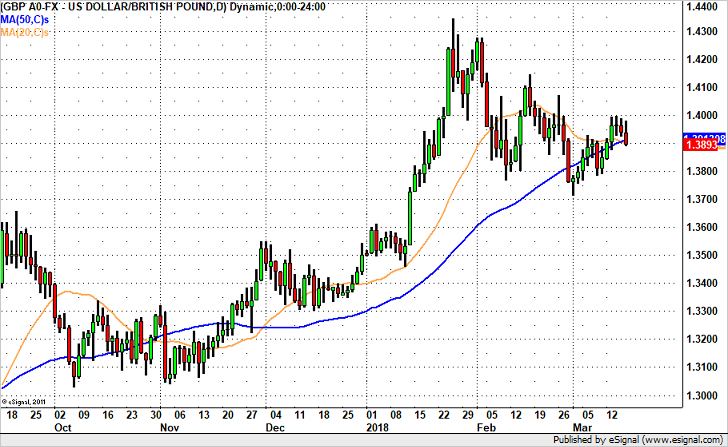 Technically, after a series of lower highs and lower lows, GBP/USD has broken below the 20 and 50-day SMA. This move is not only bearish but signals a potential move below 1.3800. Cable has been on a tear this week after bouncing off the 1.4000 level the pair made a very unusual V-shaped recovery mercilessly squeezing the trapped shorts. Although data from the UK has been mediocre at best and Brexit negotiations have not yielded any additional progress, the market does not seem to care. The U.S. dollar is trading higher against all of the major currencies this morning but the modest increase in USDJPY suggests consolidation rather than a full blown recovery. Yields are up across the board which may be helping the dollar but with the yen pairs still depressed, currencies have not recouped with Treasuries or other fixed income markets for that matter. With all this in mind, the dollar was sold aggressively oversold last week causing many currencies to become overextended and these corrections are likely to continue during the North American session. This is a big week for the dollar with a FOMC meeting, non-farm payrolls report and State of the Union address from President Trump so there’s motivation for profit taking. Today specifically, personal income and spending numbers are due -- they are likely to be mixed with wages up but spending softening in December . The weakest performing currency this morning is sterling and the strongest is the U.S. dollar followed by the Australian dollar. No reports were released from either country but U.K. yields are up the least this morning.